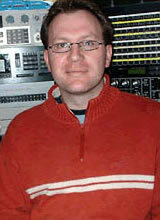 Mathew Adkins is a composer, performer, and lecturer of instrumental and electroacoustic music. He was introduced to electronic and acousmatic music during his music studies at Pembroke College, Cambridge. After he graduated from Cambridge in 1993 he pursued postgraduate research in electronic music at the University of Birmingham with Jonty Harrison and later at the University of East Anglia with Simon Waters. He first came to international attention in 1995 with two works, Melt and Clothed in the Soft Horizon, which were awarded the Stockholm Electronic Arts Award, Prix de Residence at Bourges and the Grand Prix of Musica Nova Prague. He has since been awarded prizes at the Bourges International Competition in 1997, 1999 and 2001; Luigi Russolo Competition in 1994, 2000 and 2001 as well as at EAR’95, and Musica Nova 1996. In 1994 he was awarded a British Academy Travel Scholarship which enabled him to work at EMS (Institute for Electroacoustic Music in Sweden). He has also worked at the Cesare Studios in Reims, France. Since 1996 virtually all of his works have been created in his own studio. He was a member of the Birmingham Electroacoustic Sound Theatre from 1993–95 and a Director of the Sonic Arts Network of Great Britain between 1995–97, before moving to Dublin for a year. In 1998 he became co-artistic Director of the annual Electric Spring Festival in Huddersfield, and is co-founder of the recently formed multimedia group r.a.r.e. experimental. Having worked almost exclusively in the field of electronic music for a number of years, in 2000 he returned to instrumental music and has since composed a series of works integrating live electronics into an instrumental fabric. The most recent of these will be featured at IRCAM’s Agora festival in June 2004 at the Pompidou Centre, Paris. His works have also been broadcast and performed worldwide and have been featured in numerous international festivals including the Bourges Synthese 1995 & 1997 (France), the Aspekte Festival (Austria), Futura (France), the Stockholm Electronic Arts Festival (Sweden), ACMC (New Zealand), ICMC (China and Singapore) Symposium VII (Brazil), FEM12 and Electronic Music Midwest (USA). Recent works include Nights Bright Daies for 2 pianos, 2 percussionists and electronics commissioned by IRCAM. Future projects include a new work for cello and electronics for Arne Deforce for the Music Strasbourg Festival 2004, and a new multi-channel electroacoustic work for IMEB (Bourges) 2004.